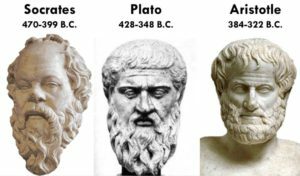 If you understand Aristotle’s views on God, metaphysics, philosophy, and the cosmos you’ll better understand Christianity. Specifically, you’ll better understand the doctrine of the Trinity, why Christians had the false interpretation of the cosmos (geocentric) for 1500 years, and other errors that were incorporated into a Christian world view. After all, Greek thinking spread into the Roman world when the Romans conquered Greece. Roman leaders had Greek slaves teach them and their kids mathematics, philosophy, astronomy, and all other areas of knowledge. 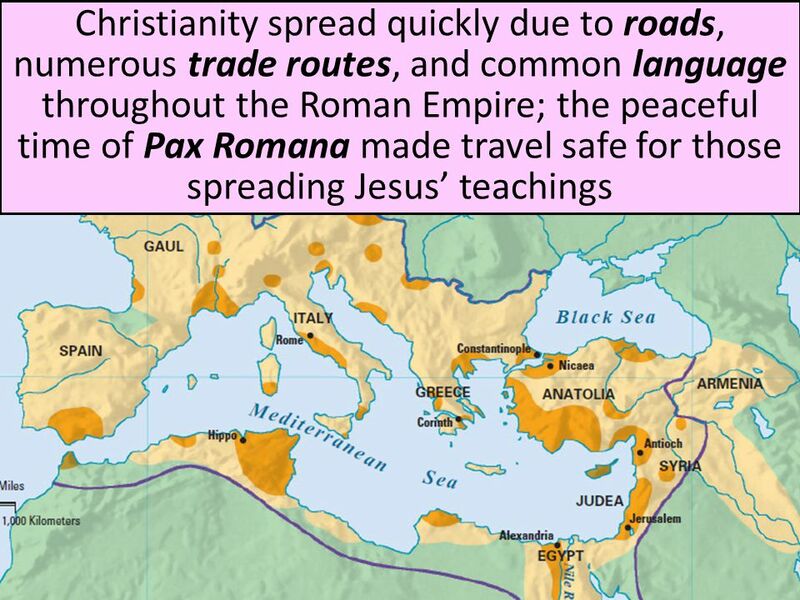 After Jesus’ resurrection, Christianity spread into a Greek world. One that believed in things just the way Aristotle did centuries before. 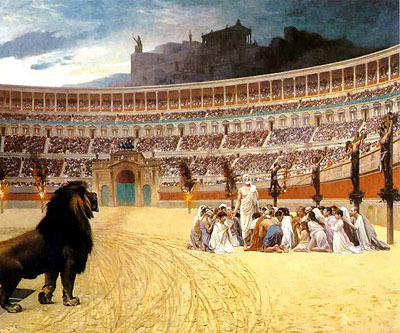 Eventually, Roman leaders persecuted Christians who believed in ideas contrary to the accepted Greek views. Jews and Romans labeled Christians polytheists for belief in 2 Gods (Father & Son). This persecution continued on and off until Christians embraces Greek philosophy, defining God and Jesus being one (2 persons, but one being) and of the same substance. 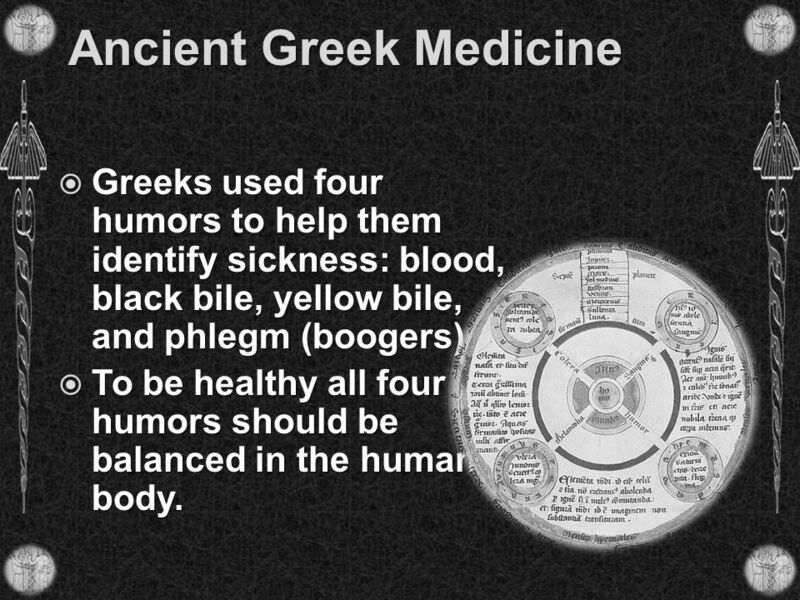 Greek medicine has been largely rejected. So has Greek astronomy. A Greek view on God’s nature has persisted, however. Aristotle had many brilliant ideas for his day. He debated non-believers and laid out proofs for God’s existence. 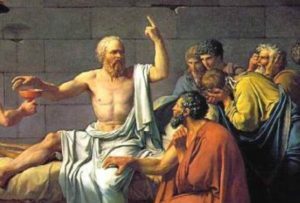 Aristotle had a theory for nearly everything. He was correct on many things, but mistaken on many others (including theological, medical, and astronomical concepts). Many of these errors were adopted without reservation by the educated and a very significant institution: the Roman Catholic Church. Nobody at the time conceived the Greeks were wrong. Indeed, these ideas were held up and propagated for centuries. These false ideas — geocentricism, Greek medicine, and others — were not rejected till the Scientific Revolution. From Christian Wheaton College. This is very dry. Joseph Smith makes it much simpler. 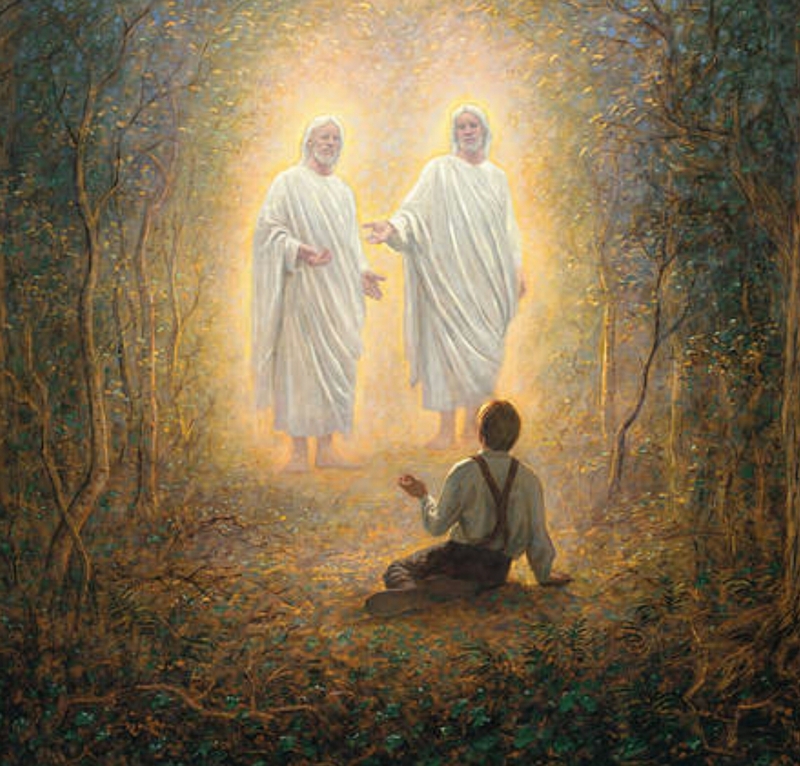 He saw two resurrected beings. 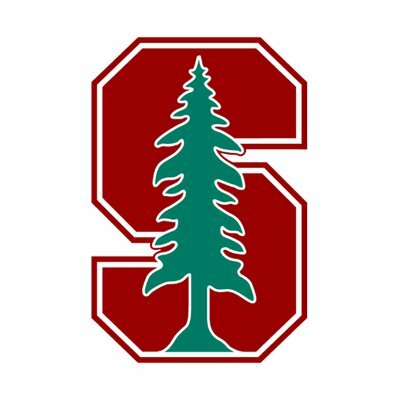 Wikipedia lists the many creeds and highlights the important historical ones here. The creeds evolved over centuries. From the Apostles’ Creed (180 AD) to the Athanasian Creed (500 AD). Latter-day Saints can agree with the early creeds. The later creeds, however, are deeply influenced by the dominant (at the time) Greek philosophy. The creed in 180 AD is simple and clear. The creed in 500 AD is not clear. Not simple. Mormons believe in the revealed truth about the Godhead. I believe in Jesus Christ, God’s only Son, our Lord, who was conceived by the Holy Spirit, born of the Virgin Mary, suffered under Pontius Pilate, was crucified, died, and was buried; he descended into hell. Furthermore, it is necessary to everlasting salvation; that he also believe faithfully the Incarnation of our Lord Jesus Christ. For the right Faith is, that we believe and confess; that our Lord Jesus Christ, the Son of God, is God and Man; God, of the Substance [Essence] of the Father; begotten before the worlds; and Man, of the Substance [Essence] of his Mother, born in the world. Perfect God; and perfect Man, of a reasonable soul and human flesh subsisting. Equal to the Father, as touching his Godhead; and inferior to the Father as touching his Manhood. Who although he is God and Man; yet he is not two, but one Christ. One; not by conversion of the Godhead into flesh; but by assumption of the Manhood into God. One altogether; not by confusion of Substance [Essence]; but by unity of Person. For as the reasonable soul and flesh is one man; so God and Man is one Christ; Who suffered for our salvation; descended into hell; rose again the third day from the dead. He ascended into heaven, he sitteth on the right hand of God the Father Almighty, from whence he will come to judge the living and the dead. At whose coming all men will rise again with their bodies; And shall give account for their own works. And they that have done good shall go into life everlasting; and they that have done evil, into everlasting fire. This is the catholic faith; which except a man believe truly and firmly, he cannot be saved. David Paulsen focuses on the LDS understanding of God. He explains that Origin, Augustine (though reluctantly), early Christians, and Jews that God believed was corporeal. This is not a Trinitarian view. 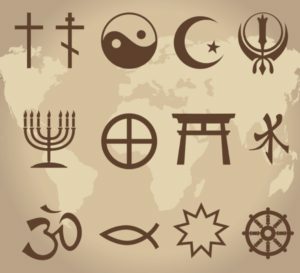 A short essay by Blake Ostler: The Logical Incoherence of Traditional Christianity. “Spiritual” receptors. Awesome insight from an endocrinologist! A common charge against Mormons is that we ignore evidence and based testimony on feelings or emotions alone. If this is true in any individual LDS person’s case it shouldn’t be! “The Trinity is a logical contradiction as opposed to a mystery. 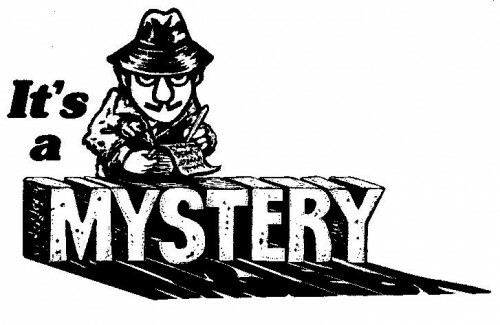 A mystery is how god could be self existent, or how there could be an infinite regression of gods, and matter be eternal. Those are mysteries which do not present a contradiction because they rely on something which is not revealed but doesn’t contradict itself. By contrast, the Trinity presents a contradiction at every point. 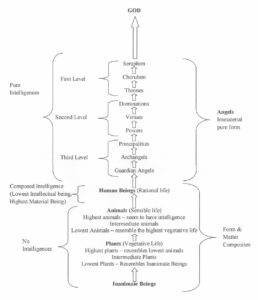 The idea of being fully god yet fully a person within that god, and there being three persons, each fully god and having all the essence of god, yet still being one of three is illogical. It is untenably illogical when you realize Jesus is sitting or standing next to god (such as Acts 7:56), who has a physical location. It is logically impossible to say a thing is next to itself. It is not just silly word games which is most of the trinity description, but it is hard fact that any thing cannot logically be next to itself. Thus the trinity is not a mystery, it is an illogical word game. It is fully explained once the correct NT understanding is provided, which was there were many gods and many lords, but God the Father and Jesus the Lord are the only ones that matter to us. There is no statement in scripture which requires the oneness of god, as described in the Ancient Near East setting, to mean anything beyond a corporate oneness, which is in fact the way Jesus described his oneness with god. When Jesus quotes from the Shema, he doesn’t include himself in it, he simply cites it. Yep. Hardly a mystery. Entire a contradiction. Another view from the 3 Mormons! These guys could be a little clearer in that creedal Christians believe the Trinity is composed of 3 persons whose substance is the same. 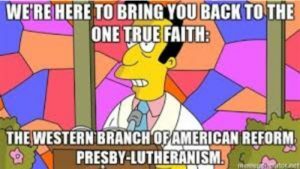 LDS Christians believe in absolutely 3 separate beings. Brant Gardner discusses the union of these ideas: monotheism, Messiah, and the Book of Mormon. Brant discusses the Father God, El; the mother God or spouse of El, Asherah; Jehovah, the preeminent among the Sons of El (the Father God); and other topics in the evolution of gods in Judaism. The Sons of God were assigned to different nations. Jehovah was assigned to Israel. By the 8th and 7th centuries BC Jehovah grew in stature, supplanting El in certain respects, as the Jews developed a proto-monotheism. The understanding of the Godhead’s nature was corrupted in the centuries after Jesus’ resurrection. 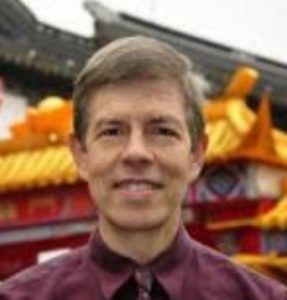 Jeff Lindsay shares many explanations here, on his blog LDS FAQ. Fiona Givens provides a history of the Trinity development in her book, The Christ who Heals: How God Restored the Truth that Saves Us. 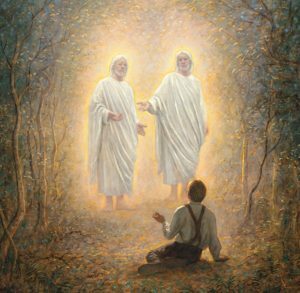 Barry Brickmore shares how the early Saints believed in much that was restored through Joseph Smith: separate Father and Son, deification, creation ex materia (not ex nihilo), and more. Greek philosophy corrupted the Christian understanding of the Godhead. 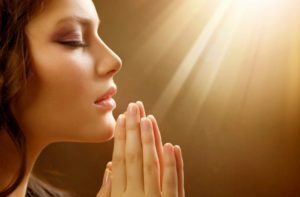 “When Christianity came into contact with the society in which that habit of mind existed, it modified, it reformed, it elevated, the ideas which it contained and the motives which stimulated it to action; but in its turn it was itself profoundly modified by the habit of mind of those who accepted it. As the church entered the third century, many ridiculed Christianity because they regarded it as polytheistic—that is, it had a theology of three Gods: the Father, Son, and Holy Ghost. 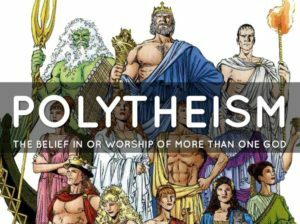 By this time the more sophisticated had rejected polytheistic pagan deities and had become monotheistic, accepting but one God. So the issue for the church was how to make Christian theology accord with respectable opinion. Tertullian, a lawyer, offered this solution: The true God was composed of immaterial spiritual substance, and though the three personages that comprised the Godhead were distinct, this was only a material manifestation of an invisible God. 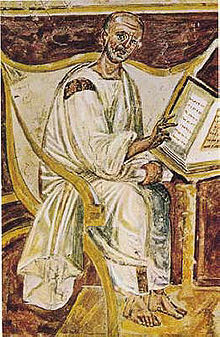 Augustine (354—430 C.E. 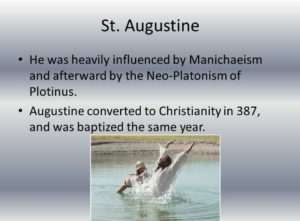 ), also known as St. Augustine, is a fourth century philosopher whose groundbreaking philosophy infused Christian doctrine with Neoplatonism. 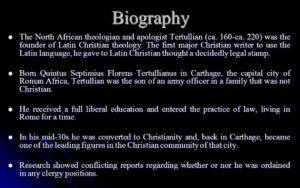 “The unsurpassed intellectual in Christian history was Augustine. 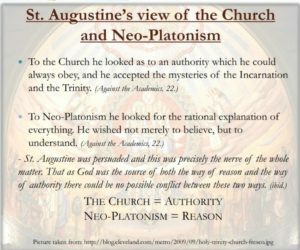 He was the one who thoroughly fused the theology of the New Testament with Platonism. 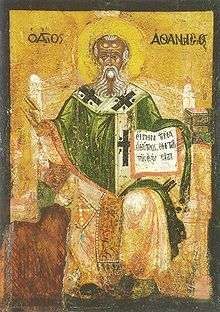 As Plato had done before him, Augustine decided that since God is the ultimate good, he cannot be associated with anything material. Robert primarily uses widely respected, authoritative Christian and Jewish scholars to establish these points: 1) The Trinity isn’t biblical. 2) The Trinity was created by Greek philosophers centuries after Jesus. 3) Multiple Gods are referenced in the scriptures. 4) Traditional monotheism isn’t supported.